The reception desk I was covering that week was in an office building that was crowded into a tightly-bunched block with another six-story office building, a mental health clinic, an organic supermarket, a trendy café, a high-rise of upscale condominiums with a private parking garage, and two senior housing apartment buildings. Cars and trucks thundered by along the street out front. Most were roaring past to make it onto a highway on-ramp before the light turned red and held them there, suspended in time, for 60 seconds. Others were coming into the city and had just exited the highway a block back, adrenaline still coursing too fast to slow down. 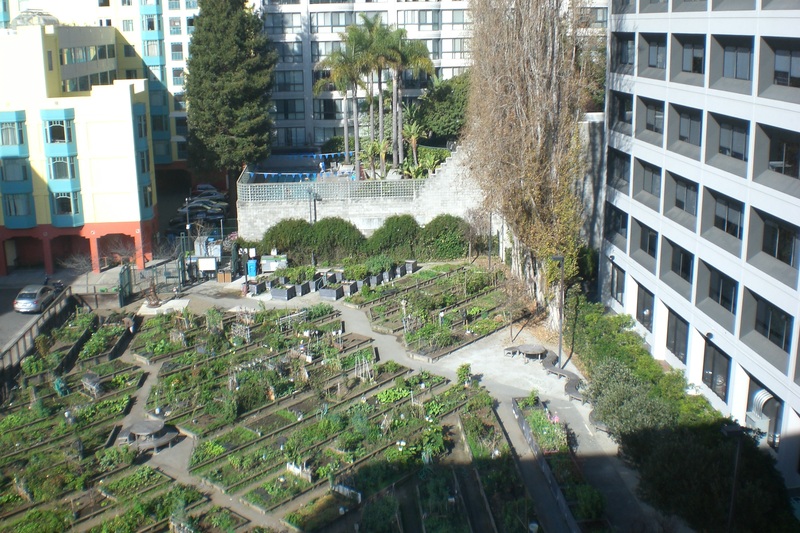 What a pleasant surprise it was to discover the community garden behind the building during my lunch break on my first day there. I saw it first from a break room on the fifth floor that overlooked the peaceful garden. No one in the office had told me it was there. I bring a brown-bag lunch wherever the agency sends me on assignment, and when lunchtime came I asked where the break area was. Even before I got to the end of the hall, the promise of something agreeably unexpected beckoned, for there was light coming through the fifth floor window at the end of the hall from an open space outside. 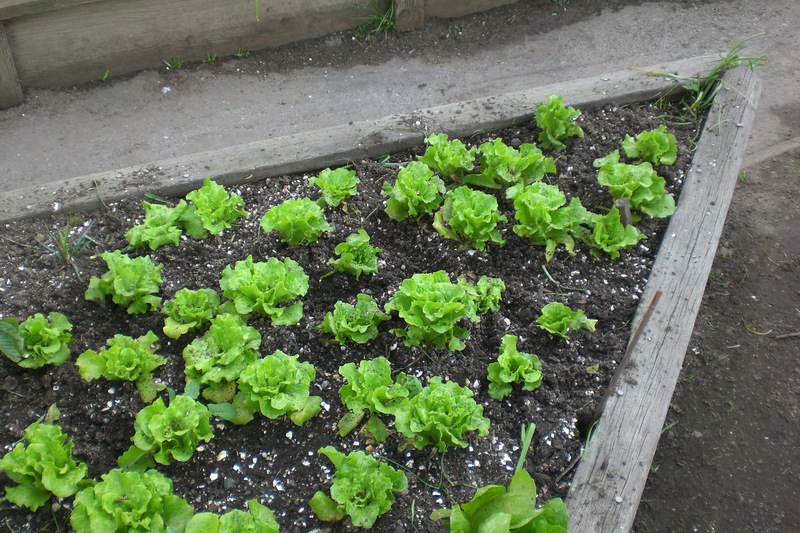 Upon reaching the window and looking down, I was greeted by geometrical rows of raised beds in which green things were growing. That first day I was content to settle into a comfy swivel chair and eat my homemade sandwich while I observed a few of the gardeners tending their plots. 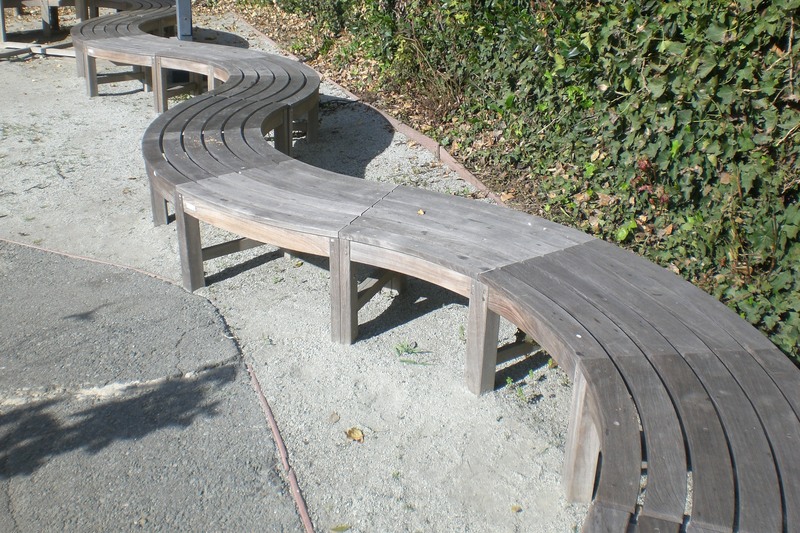 I saw a table with benches and over on one side a very inviting curving bench. On my second day there I went out on my lunch break and found a seat on the curving bench to eat and watch the hummingbirds sip nectar from the blooms, while the sparrows and pigeons foraged in the dirt. 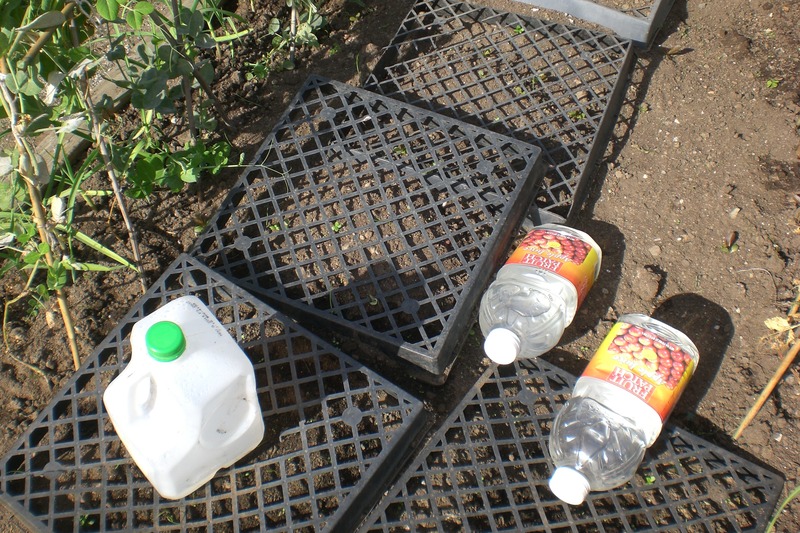 A young father was pushing his toddler in a stroller up and down the paths between the raised beds. A grandfatherly looking man strolled alone. Here and there were other people having lunch in the garden, like me. 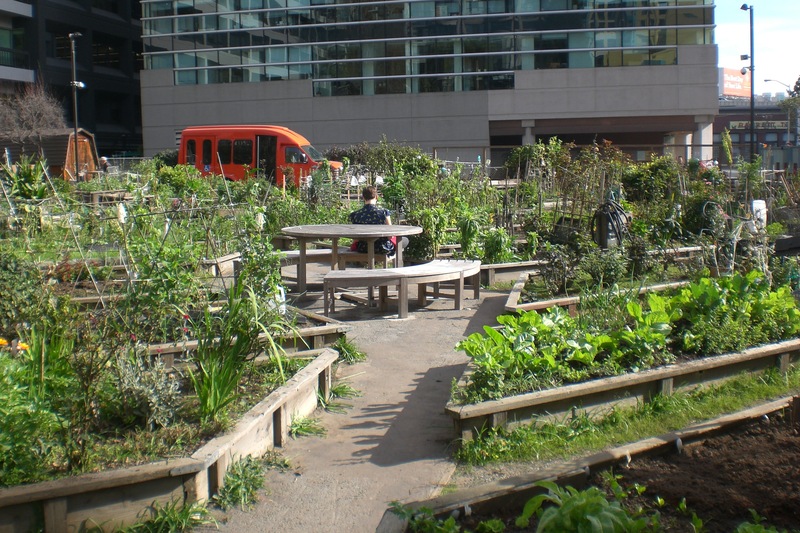 It was an urban farm and a city park in one, tucked neatly out of sight from passersby on the busy streets beyond the buildings that surrounded it. 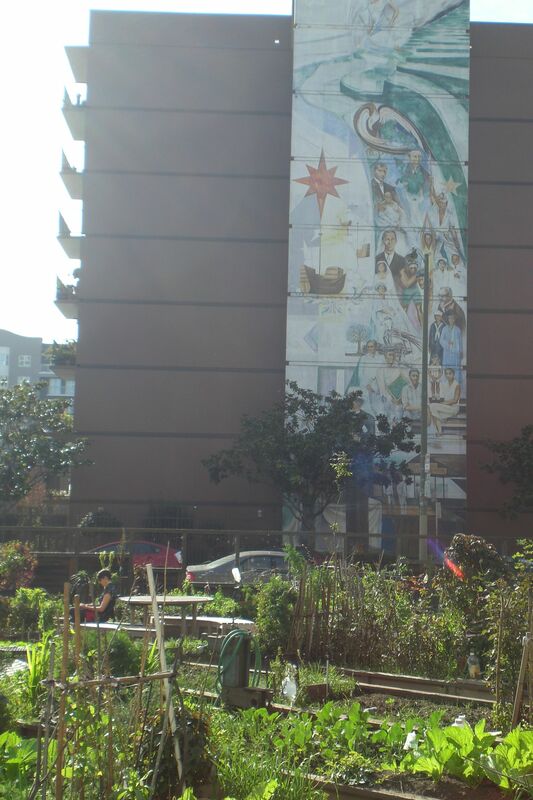 The ornamentals were lovely, but outnumbered by the crops these urban farmers were growing for their tables. 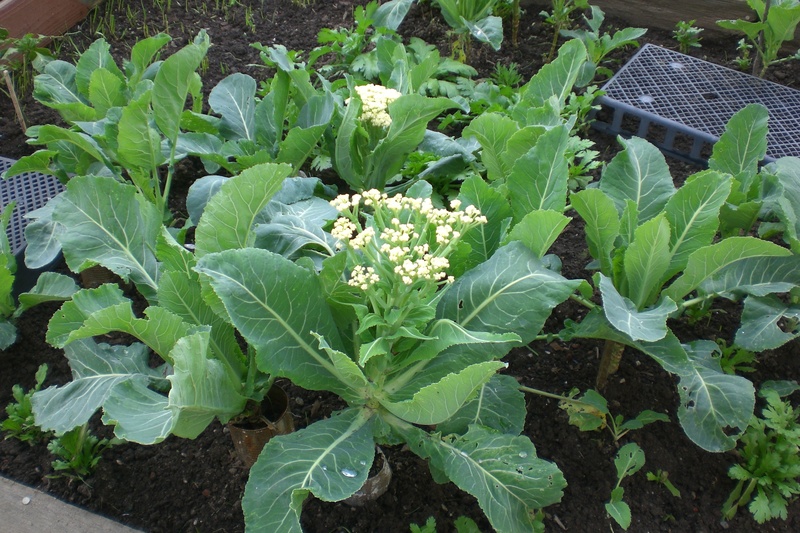 Various lettuces and other leafy greens, yellow peppers, culinary herbs and other edible plants predominated. 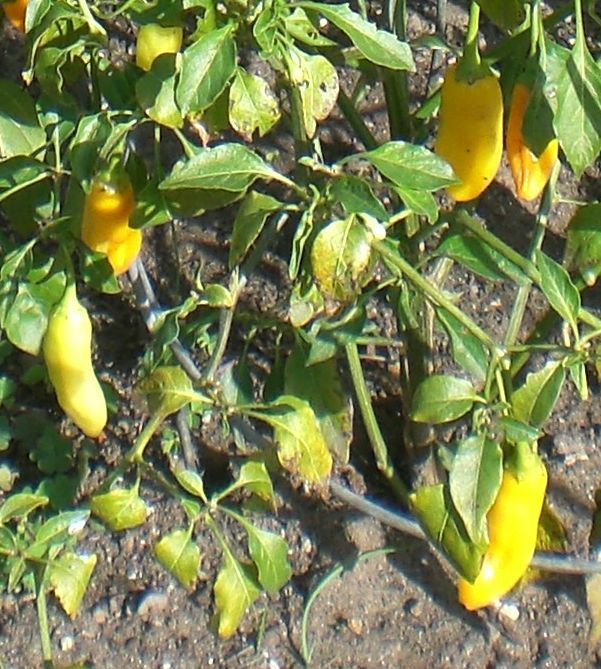 Even from the fifth-floor window that first day, I realized that the caramel-complexioned gardeners I was seeing in their floppy hats were likely residents of the predominantly Filipino senior housing buildings across the narrow alley from the garden. The fancy organic produce in the nearby supermarket is probably a bit out of reach for these folks on fixed incomes. All around the city, growth of a different kind is everywhere. Clusters of construction cranes are a common site and luxury high-rises are pushing up on every available lot. A miracle, these tillers of the soil growing their food while providing a retreat for their neighbors; for how much longer is hard to know that this undeveloped plot will remain the green oasis it is. 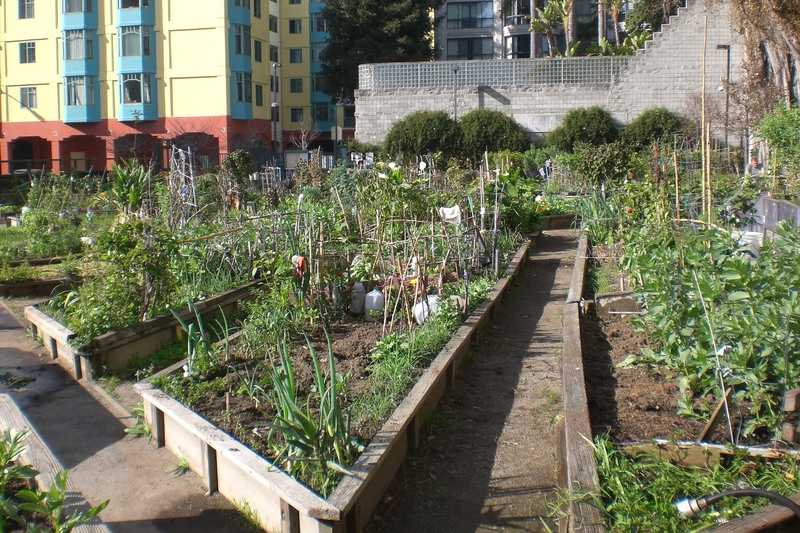 Posted on January 30, 2015 January 30, 2015 Tags Community Garden, Development, Sustainable Living, Urban Farm2 Comments on How Does Your Garden Grow?